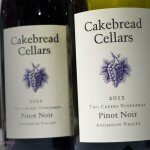 Cakebread Cellars has been making wines for over four decades with their second generation family currently at helm. The 2012 Two Creeks Pinot Noir is their first attempt with Two Creeks Pinot Noir blends grapes from our Apple Barn (60%) and Annahala (40%) vineyards in Mendocino County’s Anderson Valley, a cool-climate coastal region renowned for its superb pinot noirs. 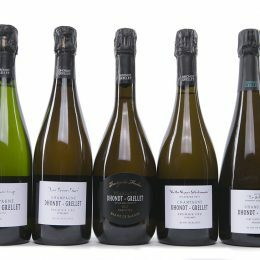 The vineyards share a marine-influenced climate and an overlapping mix of nine high-quality pinot noir clones, including the famed Joseph Swan and Pommard selections. Apple Barn is a more exposed site with gravelly soils, while Annahala is sheltered by trees and has heavier loam soils. Apple Barn enjoys warm afternoons, while Annahala, further west toward the ocean, is significantly cooler and receives more fog. The blend of the two estate vineyards yields a wonderfully complex and balanced wine. The Pinot Noir grapes are handled with cold-soaking the must (unfermented juice and skins) for several days prior to fermentation to extract early color and flavor. The must warms up naturally over the course of a week before native yeast from the vineyards spontaneously initiate fermentation, which is sustained by inoculating the fermenting wine with a cultured yeast strain. The grapes from each vineyard are fermented separately in small open top tanks with gentle daily punchdowns of the skins to extract optimal color, flavor and tannin. Post- fermentation, the free-run wines are drained from the skins and transferred to carefully selected French oak barrels, where they age three months before being blended. After blending, the wine is aged for around 10 months in French Oak Barrels (around one-third new). The wine shows a little overwhelming sandalwood notes with some fresh red fruits. Body is rather heavy on the side of over-extracted fruits. Tannins are pretty and and not too harsh. The wine should mellow in a few years and the proportion of new oak selection and blending of the two creeks could be adjusted for more finesse. 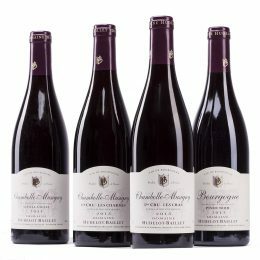 The wine is available for sale at SGD$71/750ml bottle. 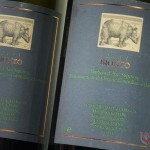 La Spinetta was founded in 1977 Castagnole Lanze was founded by Giuseppe and Lidia Rivetti. The Barbera 2011 is made of 100% Barbera grapes with 14.5% Alcohol. With 1000 cases of wine made a year, the vines are around 65 years old with calcareous type of soil. Hints of dark chocolate, dark black fruits, very full body with grippy tannins. Well made wine which doesn’t show the 14.5% of alcohol. Should age well for another 15-20 years! Sold at Corney & Barrow Singapore for SGD$72/750ml. 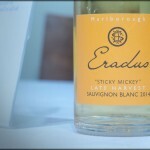 This Sticky Mickey’s cuvee is based from Awatere Valley, Marlborough, with natural Botrytis ensuring a natural concentration of sugars late into harvesting period (4th May).